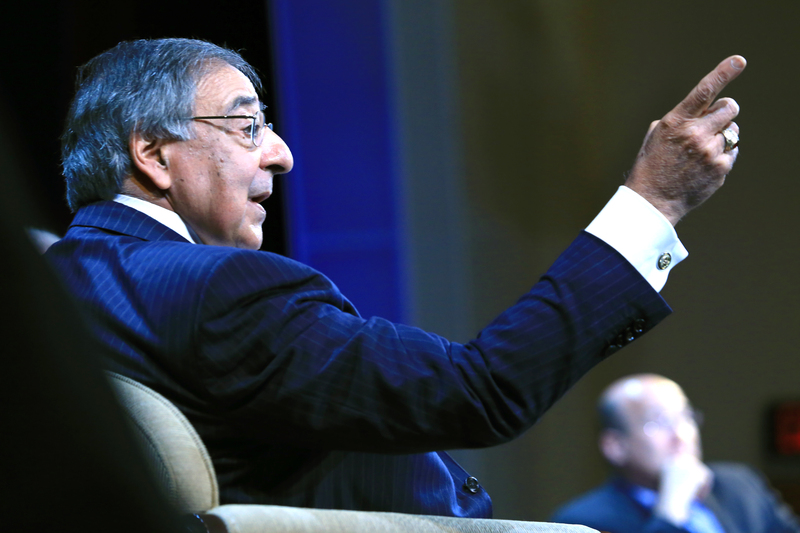 Each spring, Secretary Panetta moderates the Panetta Institute’s highly acclaimed lecture series that brings national leaders, policy experts and journalists to the Monterey Peninsula. A complete list of speakers is detailed below. The Lecture Series returns to the Monterey Conference Center in downtown Monterey. Speakers will appear before a live theater as well as television audiences. During the afternoon of each lecture, the speakers meet with students from the Central Coast and Northern California high schools, colleges and military installations. Season subscriptions are available for the entire series for $400. Individual lectures are $100 each. For information about subscriptions for the 2019 Lecture Series or to inquire about becoming a sponsor for the events, please call the Panetta Institute at 831-582-4200. Lectures are scheduled for February 25, March 25, April 15 and May 27. All events start at 7:00 p.m.
All the Leon Panetta Lecture Series programs are broadcast live throughout California by Comcast, Comcast Hometown Network, the California Channel, KQED and other cable networks. C-SPAN periodically broadcasts these lectures nationally. The lectures are also available for viewing on The Institute’s YouTube channel and via live web-streaming. They are also broadcast live on KAZU FM 90.3, the Central Coast’s public radio station. The fourth-ever Director of National Intelligence from 2010 to 2017, James Clapper is a retired Air Force Lieutenant General who served two tours in Southeast Asia, Director Clapper was the nation’s top intelligence official and the principal intelligence advisor to the president. He provided the president’s daily morning brief and held one of the broadest portfolios in the entire government, overseeing 200,000 intelligence employees internationally, a $52 billion budget, and high-profile organizations like the CIA, NSA and FBI. Director Clapper is credited with improving communication amongst domestic agencies, building partnerships with foreign governments, procurement reform, and sweeping IT upgrades. He was in the Situation Room during the famous 2011 raid on Osama bin Laden and also played a pivotal role in uncovering the likely parties at work behind the 2016 hack of the Democratic National Committee (DNC). He is currently a national security analyst for CNN and author of the new book, Facts and Fears: Hard Truths from a Life in Intelligence. One of the top national political analysts in America, Mara Liasson is a celebrated and award-winning media personality. Well known as a political contributor for FOX News, joining the network in 1997, she serves as a regular panelist on #1 rated cable news program Special Report with Bret Baier and FOX News Sunday. 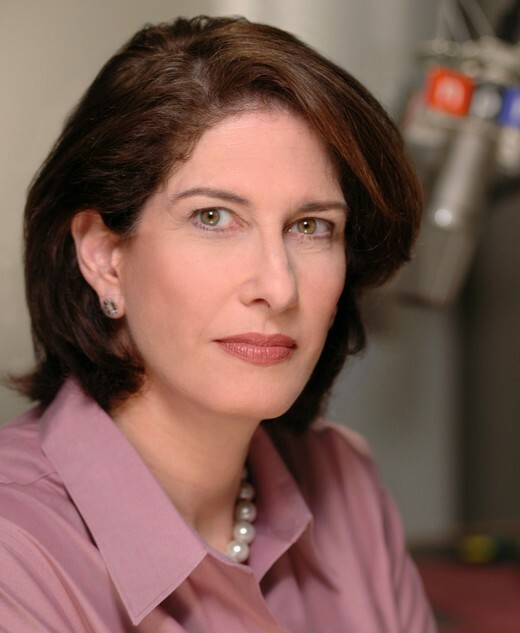 A recognizable voice on NPR, Liasson began her tenure in 1985 and later earned the exclusive assignment of White House correspondent during the eight-year Clinton Administration. Highly respected among her peers, Ms. Liasson’s coverage garnered her three coveted White House Correspondents’ Association Merriman Smith Awards — 1994, 1995 and 1997 — for excellence in daily news reporting. With her finger on the pulse of Washington politics, Liasson covered all presidential elections from 1992 to 2012. Prior to her current assignment she was the renowned and legendary voice on the award-winning newsmagazines All Things Considered and Morning Edition. As a pillar of modern American journalism, Liasson provides audiences with her take on today’s political environment and the role media plays in all of our lives. 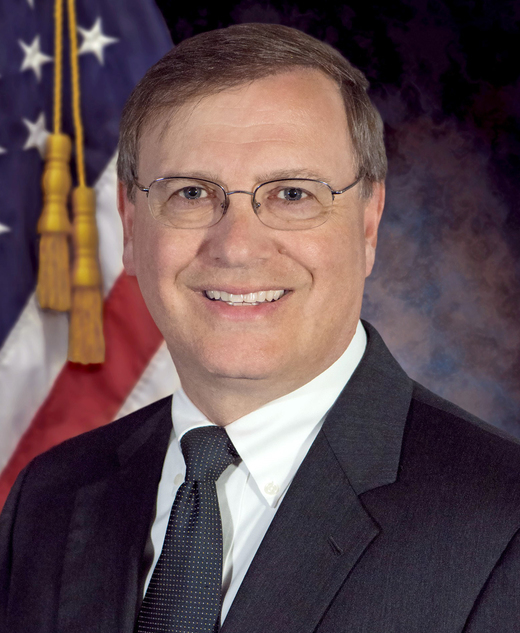 Working at the highest levels of the Justice Department and on its biggest terrorism, espionage and public corruption cases, Chuck Rosenberg’s work as a federal prosecutor, at the FBI, and at the DEA gives him unique insights into these crucial federal law enforcement agencies and a deep appreciation of the complex challenges they currently face. He is the only person to serve on the staff of FBI Director Robert Mueller (post 9/11, as Counsel) and FBI Director Comey (from 2013-2015, as Chief of Staff) before running the Drug Enforcement Administration under President Obama. A career, non-partisan professional, he also served as Counselor to Attorney General John Ashcroft, where he handled national security matters. President Bush nominated, and the Senate unanimously confirmed, Mr. Rosenberg to serve as the United States Attorney for the Eastern District of Virginia, one of the most prestigious prosecutorial posts in the nation. Inaugurated as the 55th governor of the State of New Jersey on January 19, 2010, Chris Christie was re-elected in November of 2013 serving two terms before leaving office in January of 2018. During his time in office, Governor Christie emphasized the issues of fiscal responsibility, pension and health benefit reform, education reform and addressed the opioid crisis gripping his state and the nation. Governor Christie also devised the state’s groundbreaking response to Superstorm Sandy, leading the rebuilding of the state’s housing, infrastructure and public schools and setting a bi-partisan example for storm recovery. Governor Christie was elected Chairman of the Republican Governors Association in 2014, leading the organization to a record fundraising effort and the -more- election of thirty-one Republican Governors. On March 29, 2017, President Trump appointed Governor Christie as Chairman of the President’s Commission on Combating Drug Addiction and the Opioid Crisis. Governor Christie is now a senior legal and political commentator for ABC News. 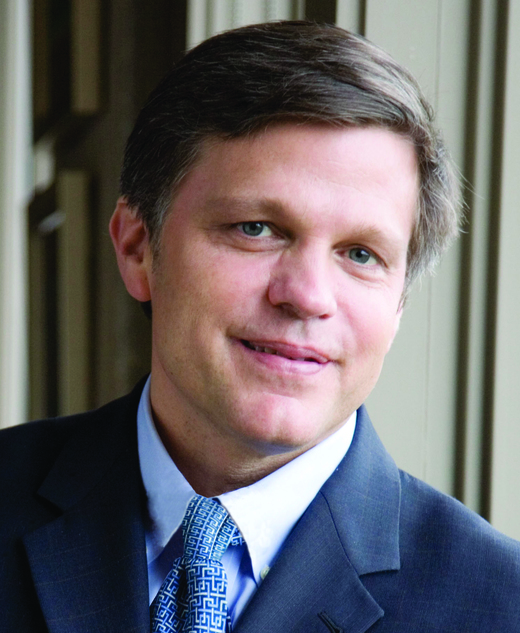 A political advisor, reform advocate, media columnist, and television producer., Mark McKinnon was the chief media advisor to five successful presidential primary and general election campaigns and is cofounder of No Labels, an organization dedicated to bipartisanship, civil dialogue, and political problem solving. 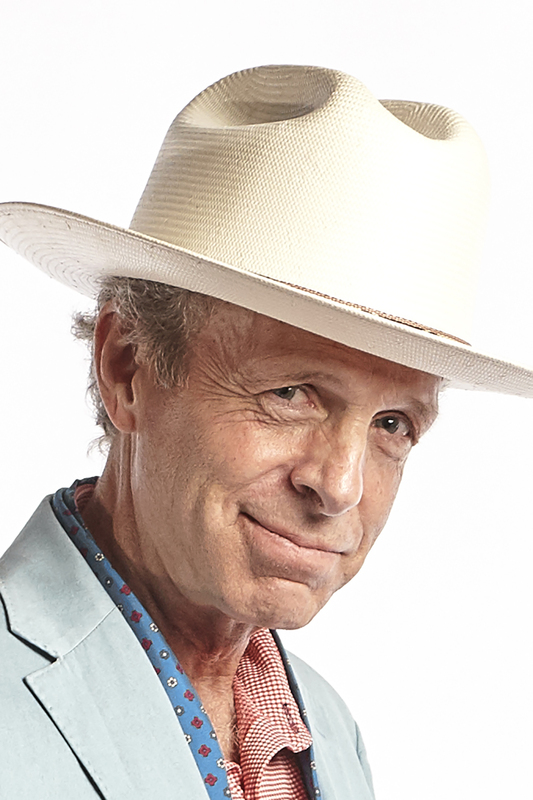 Mr. McKinnon currently serves as the co-host of the hit Showtime weekly documentary series The Circus: Inside the Greatest Political Show on Earth, which provides unique access and insights into the 2016 presidential campaign and the Trump presidency. Mr. McKinnon has been a regular columnist for The Daily Beast and The Daily Telegraph and was a consultant to the television series The Newsroom and House of Cards. An award-winning media producer and communications strategist, Mr. McKinnon has been awarded more than thirty Pollie and Telly Awards, honoring the nation’s best political and public affairs advertising. 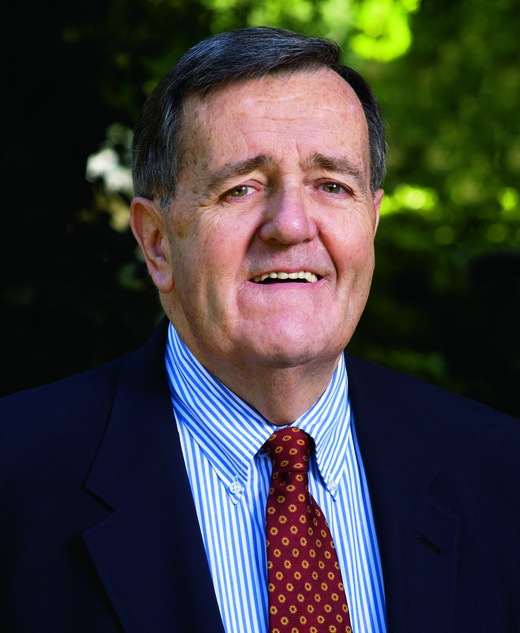 A nationally known columnist and commentator who has worked in Washington through the administrations of ten United States presidents, Mark Shields first went to Washington in 1965 to work for United States Senator William Proxmire (D-WI). In 1968, he joined United States Senator Robert F. Kennedy’s presidential campaign and later held leadership positions in three other presidential campaigns. For eleven years, Mr. Shields helped manage campaigns from the courthouse to the White House in some thirty-eight states. He began writing his column for The Washington Post in 1979, which is now distributed nationally. In 1988, Mr. Shields began his seventeen-year stint as moderator and panelist on Capital Gang, CNN’s landmark political debate program. That same year he joined the award-winning PBS NewsHour providing weekly political analysis and commentary on national campaigns. He is now a regular panelist on Inside Washington, the weekly public affairs show broadcast on both ABC and PBS. Mr. Shields is the author of the well-received book, On the Campaign Trail, which detailed the 1984 presidential campaign between Walter Mondale and Ronald Reagan. Considered onsidered one of the most distinguished career diplomats of our time with a twenty-seven year career in diplomatic service, R. Nicholas Burns has served under Democratic and Republican presidents. Ambassador Burns offers a bipartisan perspective on foreign policy, globalization and security affairs. 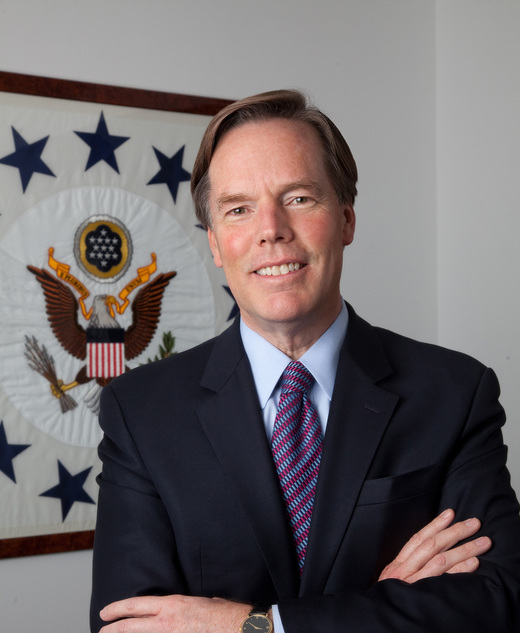 Ambassador Burns began his diplomatic service in 1980, working as an intern at the American embassy in Mauritania. He later served on the National Security Council (NSC) at the White House for five years, working in the administrations of Presidents George H.W. Bush and Bill Clinton. During his work on the NSC, Ambassador Burns was director for Soviet Affairs, director for Russia, Ukraine and Eurasia Affairs and special assistant to President Clinton. In 1995, Ambassador Burns was named spokesman for the United States State Department. In 1997, he was appointed Ambassador to Greece. He served in that post for four years before being named Ambassador to NATO. Promoted to under secretary of state for political affairs in 2005, he led negotiations on a number of key agreements on nuclear disarmament including: the United States–India Civil Nuclear Agreement; a long-term military assistance agreement with Israel; and was the lead United States negotiator on Iran’s nuclear program. Ambassador Burns currently serves as the Goodman Professor of Diplomacy and International Relations at Harvard’s Kennedy School of Government. He is also a widely sought-after media commentator appearing frequently on PBS, FOX, MSNBC, BBC and CNN, and writes frequently for major international publications on foreign affairs. A retired four-star general and a forty-five-year Marine veteran, John Kelly He headed the United States Southern Command (SOUTHCOM) focusing on border security, organized crime, terrorist organizations and drug traffickers in Latin America for more than three years. Before his SOUTHCOM command, General Kelly led the Multi-National Force — West in Iraq during the first year of the Obama administration. He was also the legislative assistant to the Marine Corps commandant from 2004 to 2007 and, later, the senior military aide to Defense Secretaries Robert Gates and Leon Panetta. After less than a year in retirement Secretary Kelly was offered the opportunity to serve the nation and its people as the Secretary of Homeland Security. The United States Senate confirmed him on January 20, 2017 and he was immediately sworn in as the fifth Secretary of Homeland Security. Secretary Kelly went on to serve as Chief of Staff for President Donald Trump from July 31, 2017 to January 2, 2019. 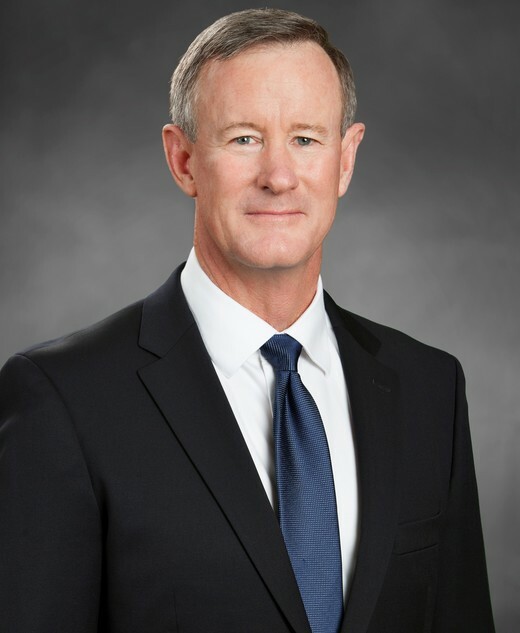 A recognized national authority on United States foreign policy who has advised Presidents George W. Bush, Barack Obama, among other leaders William McRaven has commanded special operations forces at every level, eventually taking charge of the United States Special Operations Command. His career included combat during Desert Storm and both the Iraq and Afghanistan wars. Admiral McRaven commanded the troops that captured Saddam Hussein and rescued Captain Phillips. He is also credited with developing the plan and that led to bringing Osama bin Laden to justice in 2011. In 2014, Admiral McRaven was named Chancellor of the University of Texas System leading one of the nation’s largest and most respected systems of higher education. He served in that role until 2018. Admiral McRaven serves on the Council on Foreign Relations (CFR) and the National Football Foundation. He is the author of two books, SPEC OPS: Case Studies in Special Operations Warfare and Make Your Bed: Little Things That Can Change Your Life and Maybe the World. May 27, 7:00 p.m.: Checks and Balances — What Was the Hope of our Forefathers? Has it Worked? The New York Historical Society has chosen Dr. Brinkley their official “United States Presidential Historian.” His recent book Cronkite won the Sperber Prize while The Great Deluge: Hurricane Katrina, New Orleans and the Mississippi Gulf Coast received the Robert F. Kennedy Book Award. Dr. Brinkley has received a Grammy Award for Presidential Suite and seven honorary doctorates in American Studies. His two-volume annotated work The Nixon Tapes recently won the Arthur S. Link – Warren F. Kuehl Prize. He is a member of the Century Association, the Council on Foreign Relations and the James Madison Council of the Library of Congress. 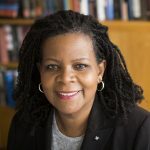 The Charles Warren Professor of American Legal History at Harvard Law School and a Professor of History in the Faculty of Arts and Sciences at Harvard University, Annette Gordon-Reed is a renowned law professor and scholar of American history. Dr. Gordon-Reed has taught at the New York Law School and at Rutgers, the State University of New Jersey. She has published six books, among them The Hemingses of Monticello: An American Family (2008), which won numerous awards, including the Pulitzer Prize in history and the National Book Award for nonfiction. Dr. Gordon-Reed is also the author of Thomas Jefferson and Sally Hemings: An American Controversy (1997). This book was a nonfiction finalist in the first annual Library of Virginia Literary Awards. Dr. Gordon-Reed’s most recently published book (with Peter S. Onuf) is Most Blessed of the Patriarchs: Thomas Jefferson and the Empire of the Imagination. Her next book, A Jefferson Reader on Race, is forthcoming from Princeton University Press. She was elected a Fellow of the American Academy of Arts and Sciences in 2011 and is a member of the Academy’s Commission on the Humanities and Social Sciences. For a list of past speakers, click here. The Panetta Institute would like to salute the sponsors of the 2019 Lecture Series for their extraordinary public service in supporting this important event. For information on becoming a sponsor, call the Panetta Institute at 831-582-4200. Hamilton, Rabinovitz & Associates, Inc.
Pacific Coast Building Products, Inc.